to chant at home and share with friends? Hey Chantaholics, Daniel Tucker here. 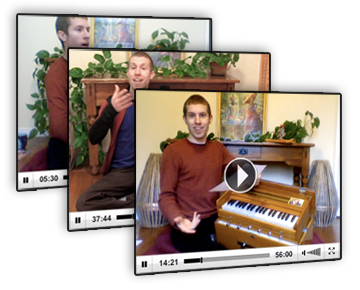 The Bhakti Breakfast Club is an online library filled with videos of harmonium classes. There are literally hundreds of harmonium tutorial videos, progressing from the very basics, through to learning a wide variety of popular and traditional kirtan songs. No prior experience necessary. Learning a healthy mix of new kirtan songs is the best way to keep growing. Not only is each song fun to sing, it's also an opportunity to practice a new scale, a new mantra, a new chord, so that your skills on harmonium continue to develop. Kirtan songs are definitely the focus of the Bhakti Breakfast Club, but there are also many class videos on various other musical topics, as well as guided harmonium repair videos! Featuring songs from a variety of kirtan recording artists such as Krishna Das, The Kirtaniyas, and Jai Uttal, as well as traditional kirtan songs from India. 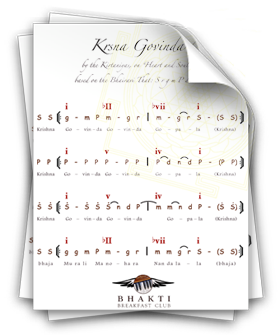 Each course features a different mantra - one is a "Radhe Govinda," the next a "Hare Krishna," and so on. You'll have 24/7 access to dozens of video-based courses, each containing multiple class videos. All in all, lots of face time with Daniel and close ups of his hand on the harmonium's keyboard, showing you every aspect of playing kirtan songs. 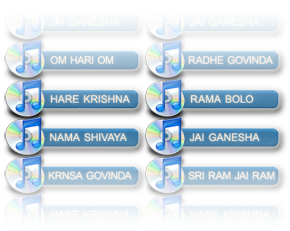 Each song you'll learn in the Bhakti Breakfast Club is recorded as an mp3 featuring voice and harmonium, so it's easy to get a feel for the song before you start to work on it. So if you'd like to start expanding your repertoire of kirtan songs, go ahead and click the "join class" button below. When you become a Bhakti Breakfast Club member, the monthly payment is automatic, and you'll have 24/7 access to the entire library of class videos from the comfort of your own home. Of course you can cancel your membership at any point, there's no long-term commitment. I look forward to continuing to support your musical journey! As ever, feel free to drop me an email if any questions come up.